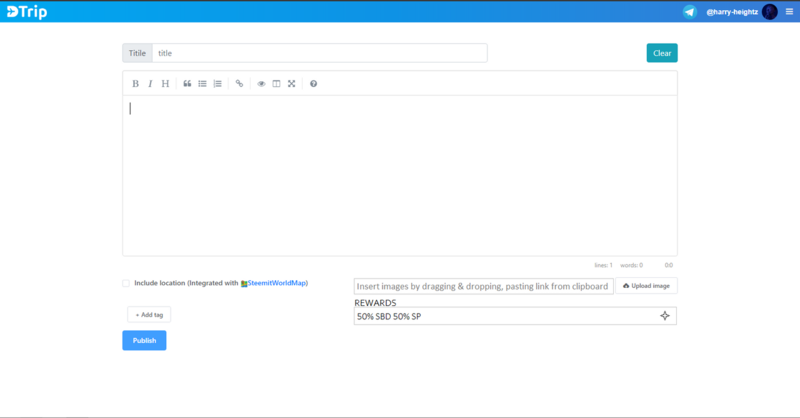 Dtrip; Implement drafts, insert images by dragging & dropping, pasting image link/address & rewards payout options. This feature request would affect the post editor on Dtrip. I noticed recently that the app doesn't retain drafts, which is a sad thing really. I was trying out the new post editor and I had entered some texts. I exited the page with hopes that I can continue from where I stopped when I returned. Unfortunately, I met an empty post editor. Another thing I noticed was that I couldn't add images to my post by dragging and dropping it on the post editor. Furthermore, I tried pasting an image link and it didn't work either. These issues led me to make this proposal. There won't be a dedicated drafts page for this feature, except the project owner decides otherwise an create a separate drafts page just like it is on busy.org. That would be great to have, but, it might be too much work. The drafts feature would work like it is on other platforms. The post editor will retain content typed on it even after I exit the page or even close the browser. Then when I access the post editor again, the content would still be available. Insert images by dragging & dropping, pasting image link/address. This feature is the ability for a user to upload images on his/her post simply by dragging and dropping it on the post editor, or by pasting the image link on the post editor. I'd ideally love to be able to control how my post should payout. Sometimes, I want the rewards shared 50/50 % between SBD and SP: and at other times, I'd love the payout to be 100% steem power. That's why I'm suggesting the implement of rewards payout options. There's no way to represent in a picture how the drafts feature would be implemented. It can only be experienced, except the project owner decides to implement the drafts style that's available on Busy.org. The benefits of these features cannot be overemphasized. The drafts feature is like a fail-safe for when users accidentally close the webpage. They can always continue from where they stopped. Dragging and dropping an image on the post editor or by pasting the image link is a faster way to upload images. Reward payout options on the app would give users the ability to control their post-payout.